Scanned by me from the TRC artbook "album de reproductions 2"
Yes wow indeed. very nice pic! Thank-You so much for sharing this & Thank you for letting me know YamiSakura38! ;) You alway's have such beautiful scans. 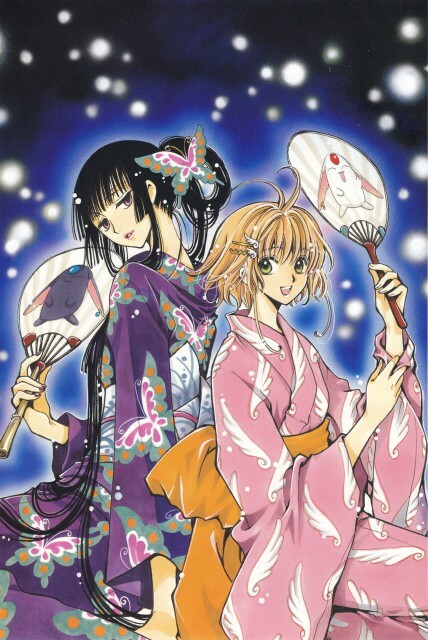 I'm in love with CLAMP, so this makes me very happy! :) & again I've never seen this image before...where do you find such awsome scans? So pretty.... thanks for putting this up, Sakura and Yuuko are awesome! So cute ! Thanks for sharing ! Haven't seen this picture yet. Thank you! It's pretty. i love you for sharing this! I want a mokona fan too >.<! I love Yuuko's Kimono. =D Nice scan. Thank you for sharing. Wow, what a lovely picture by CLAMP. Love the designs on the kimonos. I wish I had a mokona fan too.